Mind-controlling fungi that manipulate ants have become quite well-know among the general public due to their ability to induce a "zombie-like" state in their host, but ants are not the only insects that can get infected by fungi, nor are they the only insects to get mind controlled by them. The study featured in this post is about a zombie beetle fungus call Eryniopsis lampyridarum which infects the goldenrod soldier beetle. Despite its name, the goldenrod soldier beetle is not as formidable as its name might indicate. The name is actually based on the first described soldier beetle species which has a colour pattern that resembles the coat of 17th-19th century British soldiers. 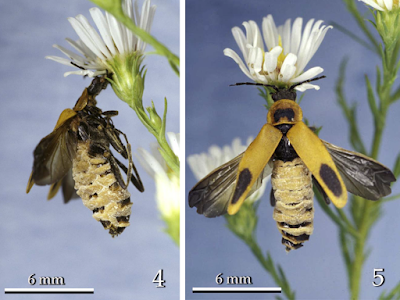 When the fungal infection in a beetle ripens, the infected insect will seek out a flower and clamp their mandibles around it in a vice-like grip. This is rather reminiscent of some zombie ant fungi which cause their hosts to position themselves on the underside of leaves where they can sprinkle spores into the path of uninfected ants. But the zombie beetles don't clamp themselves to leaves, nor do they bite down on just any old flowers, they only chose those from the Asteraceae - better known as daisies. After biting down on a daisy, the infected beetle succumbs to the infection. But the fungus is not done with its host quite yet. Slowly, the dead beetle's wing covers and wings unfurl throughout the night, revealing a bloated abdomen brimming with fungal growth. By dawn the wings and their covers are full extended. 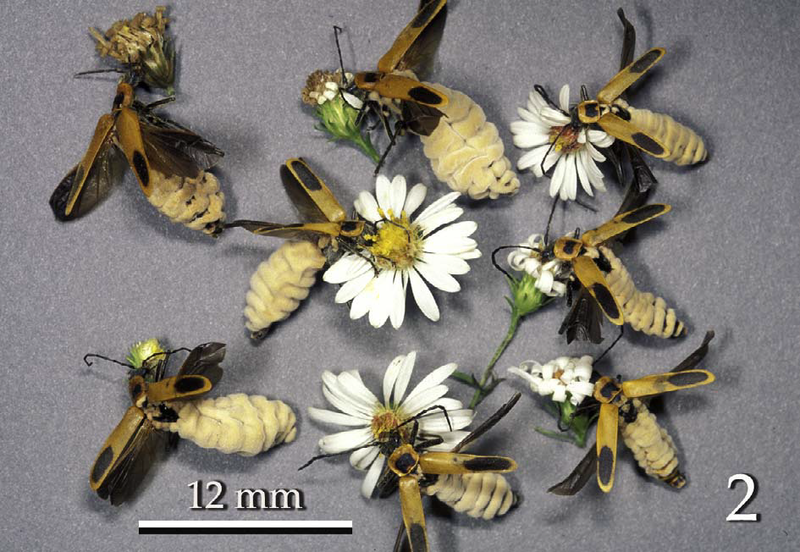 So why have daisies as the final resting place for these zombie beetles? Also why unfold the wings and their covers at night just before daybreak? For soldier beetles daisies, are like pubs or cafe - that's where they congregate to feed and possibly socialise with other beetles. So by placing itself on a flower, the zombie beetle is in prime position to meet its uninfected cousins. Unlike the zombie ant fungus which sprinkle its spores onto the ground to infect foraging worker ants, the spores of E. lampyridarum stays on the zombie beetle because that's where uninfected beetles are likely to come into contact with them. While some degree of mind-control is involved in getting the beetles to bite down on flowers, unfolding the wings seems to be a purely mechanical process. The wing unfolds long after the host has died, but the fungal growth propagate in such a way that it pushes the connective tissue at base of the beetle's wings and forces them to unfold. The fungus acts like the hand in a puppet, animating the beetle's dead body as if it is some kind of chitinous marionette. But not all the infected beetles eventually become flower-clampers, some infected beetles simply die without ever climbing onto or clamping onto a daisy. In that case, the beetle are filled with thousands of resting spores, which unlike the ones on the zombie beetles, are not immediately infective. But those spores can last for a long time in the environment. For those beetles, when their bodies hit the ground and are broken apart by scavengers and microbes, they end up seeding the soil with a bank of viable spores. So whereas the purpose of the infective spores on those flower-clamping zombie beetle is to spread the infection far and wide in the moment, those resting spores are an investment for the future - they are hardy and resistant, and their purpose is to wait in the soil for the next season, when they will unleash a brand new wave of zombifying plague. 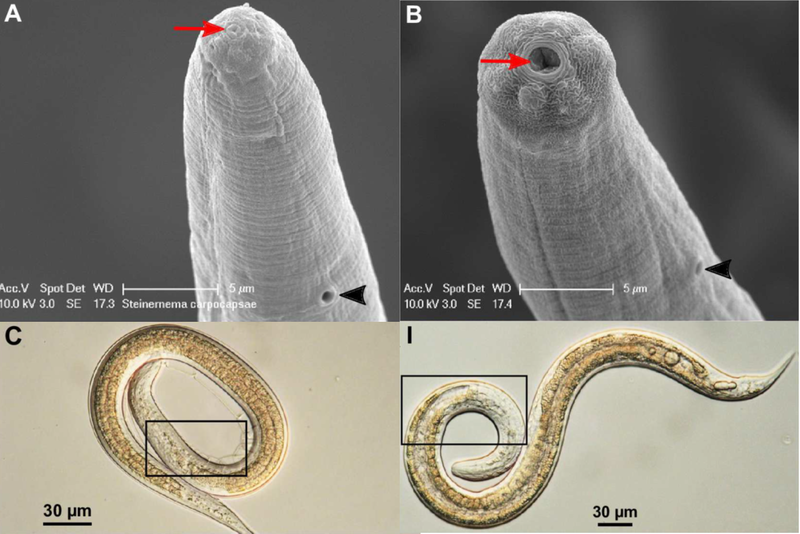 Earlier this year, I wrote a post about Heterorhabditis bacteriophora; an insect-killing nematodes that uses bacterial symbionts to kill its host and turning its innards into a nutritious soup. But H. bacteriophora and its kin in the Heterorhabditidae family are not the only nematodes that have adopted the insect-killing life. Another family of roundworms, the Steinernematidae, have also independently formed their own insect-killing partnership with bacteria. The study featured in this post focuses on Steinernema carpocapsae - like the heterorhabditids, this parasite uses its bacterial symbionts as a weapon by unleashing them in the insects that they infiltrate. But this new study shows that there's more to those worms than just a bacteria delivery vehicle. Steinernema carpocapsae is an extremely capable killer, so much so that a single S. carpocapsae larva (which is only only about half a millimetre long) is enough to bring down an insect and turn it into an incubator for thousands of newly spawned worms. This parasite's bacterial partner in crime is Xenorhabdus nematophila, a bacteria which are found exclusively with S. carpocapsae and are responsible for producing the insecticidal toxins. For the average insect, a lethal dose of X. nematophilus consists of about 3500 bacterial cells. But, each S. carpocapsae only carries 20—200 cells of X. nematophila - well below the lethal dose. The fact that a single worm is enough to kill an insect host with so few bacterial cells means that S. carpocapsae isn't just relying on the bacteria to do all the dirty work. When a newly spawned S. carprocapsae crawls out of an insect carcass into the outside world, they look like just another nondescript soil nematode. They do not feed during that stage, so their mouth and guts are sealed shut. But when a S. carpocapsae larva encounters a suitable host, its body starts changing - its head swells up, its mouth opens, and its gut expands (see the photos above). It's like going through puberty, except instead of getting acne on your face or have hair sprout from certain places, or your voice changes, S. caprocapsae turns from a seemingly innocuous worm into a lean, mean parasitic killer. But aside from such physical changes, these infective larvae also start spewing out a complex cocktail of proteins. When researchers isolated and examined this mixture more closely, they found that it was made up of 472 different proteins - many of them are proteases, which are digestive enzymes that breaks down proteins and cellular structures. There are also some peptide toxins similar to those found in other parasitic nematodes, but the functions of the vast majority of those molecule are unknown. And it turns out this cocktail can be quite toxic for insects. Fruitflies that are injected with S. carpocapsea toxins die within two to six hours, and it proved equally deadly for silkworms. Waxwmoth larvae fared a little better - while the toxins left them paralysed, they were able to recover after 24 hours, though a bit battered and bruised from the experience. As deadly that might seem, based on the outcome of the lab experiments, it would take 20 parasite larvae about 24 hours to produce enough toxin to kill a fruitfly - which is a far cry from what goes on in the wild where a single S. carpocapsae can take down insects larger than fruitflies within two to three days. This nematode cocktail also expires pretty quickly, and completely loses its killing power after 54 hours. However, we have to keep in mind that the proteins S. carpocapsea produces are not acting alone. Despite the parasite's toxic arsenal, its symbiotic bacteria still plays a very important role in killing the insect host. Also of the hundred of proteins that that S. carpocapsea secretes, not all of them contribute to the insect-killing process through sheer toxicity, some might work in conjunction with some of the bacteria's own toxins to boost their lethality. Some might be running interferences that suppress the host's immune system, which is a distinct possibility given their similarity to the peptide toxin secreted by other parasitic nematodes. Understanding how all these proteins work, and how they function with S. carpocapsae's bacterial symbionts would require further investigation. With its arsenal of toxins and deadly bacterial symbiont, S. carpocapsae is the stuff of nightmares for insects in the undergrowth. But it may also give us insight into how parasitic nematodes overcome or subvert their host's defences, and how animal-microbe symbioses function in their respective environments. Lu, D., Macchietto, M., Chang, D., Barros, M. M., Baldwin, J., Mortazavi, A., & Dillman, A. R. (2017). Activated entomopathogenic nematode infective juveniles release lethal venom proteins. PLoS Pathogens, 13(4): e1006302.